Occasionally, a forced restart is happening on my Windows 10 computer. When the OS is restarted every program that I've had prior to the restart is reopened at startup. The programs are reopened like I would just double-click them. I usually hold 5-6 windows of Visual Studio and few more programs all together. When the above happens, I have to wait several minutes until I can start working, as everything takes ages to load. Is there a setting to disable these programs from automatically opening at startup? Good news! It has been somewhat "fixed." 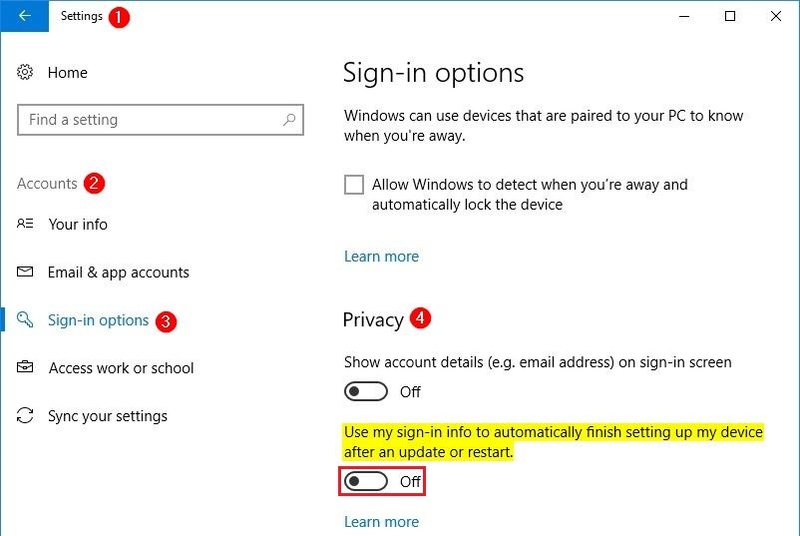 Use my sign-in info to automatically finish setting up my device after an update or restart. I was skeptical, because that doesn't seem like it has much to do with reopening my Google Chrome upon restart, but I tested and it (finally) works! Update: with the release of Windows 10 version 1803 (the April 2018 Update), Microsoft modified the wording within that Privacy option to emphasize that it will "reopen my apps" if it is configured to be On. 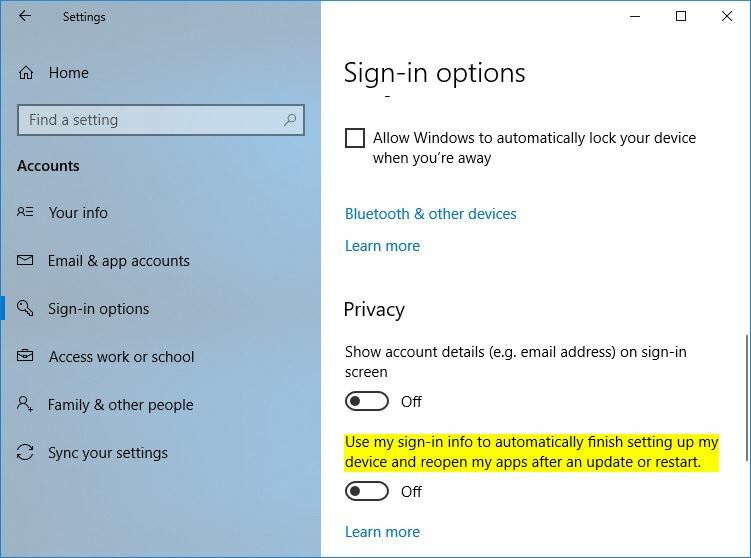 Use my sign-in info to automatically finish setting up my device and reopen my apps after an update or restart. This is a new "feature" in Fall Creators Update. To prevent apps from being reopened after reboot, don't use the Start > Shutdown button. Instead, use the shutdown.exe command-line. If you want to start with no apps open (other than those set to auto-start via Task Manager/Start), you'll need to ensure all apps are closed before shutting down or restarting the PC. Wish they had included this for "installation/updates require a restart" only. Didn't find any GPOs so far or any way to turn it off. Place this somewhere on the drive that the user would have read rights too. In gpedit.msc, then under User Configuration → Windows Settings → Scripts add the script as a logoff script. The fastest way to reboot without reopening apps I found is: click anywhere on the desktop (or Winkey-D) and then alt-F4 and choose "restart". I just denied all "write" permission for myself to the registry key HKCU\Software\Microsoft\Windows\CurrentVersion\RunOnce. Not the answer you're looking for? Browse other questions tagged windows windows-10 boot or ask your own question. Windows 10 not really “shutting down”?